Megan Furgoli is lo oking for a student to do a commission for her. 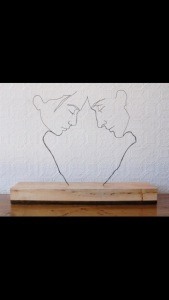 She wants a wire sculpture in the shape of two faces in profile, connected at the foreheads. She submitted a photo of her inspiration (on the left). Megan’s pricing for this job is $75-150, and pricing may vary depending on difficulty/time required/materials cost. The deadline is October 9.